While the moniker Iron & Wine blipped here and there on my radar and your humble narrator thinking that it would not be the worst name for a band anchored in the unsägliche genre that has become known as Neofolk, I had never actually listened to Sam Beam and his musical explorations prior to this gig. 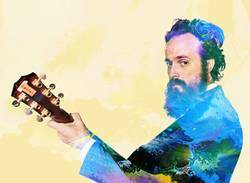 Six albums and fifteen years in, Iron & Wine incarnated at Sydney’s Opera House underneath cloud props set against a blue background, allowing the audience to focus on the music without further frivolous ornamentation or distractions. While a bit of homework on the man revealed that throughout his career he here and there employed the full-sound of a band as well as electronic moments, stripped down acoustic folk was the name of Sam Beam’s game tonight with Iron & Wine’s strength brought to the fore, i.e. delicate songwriting skills, vocal harmonies, reflective lyrics and emotionally swelling, slowly building melodies. Drenched with melancholy yet switched on and both charming, cheeky and humorous when it comes to banter and crowd interaction, Sam Beam navigated through the evening with intense warmth, serenading the audience with dreamy, spacious sounds that give the show a celebratory feel. The evening made feel like I have had an Iron & Wine shaped hole in my musical collections and while Beam holding court in one of Sydney’s more beautiful venues as part of 2018’s Vivid Festival still reverberated, it did not take long until it was filled with his back catalogue which leaves one thirsting for more. Words by T on May 29, 2018, 12:22 p.m.
Posted by T on May 29, 2018, 12:22 p.m.